Having an out-of-body out-of-town kind of afternoon. Drove to Fayetteville and found Dickson St. Books, a gem of a used bookstore. Found a few small treasures, including an Art Nouveau book published in 1972, complete with gorgeous color plates. I am reminded of Paris last summer, the d'Orsay and the most stunning collection of this original work I've ever seen; such gorgeousness. 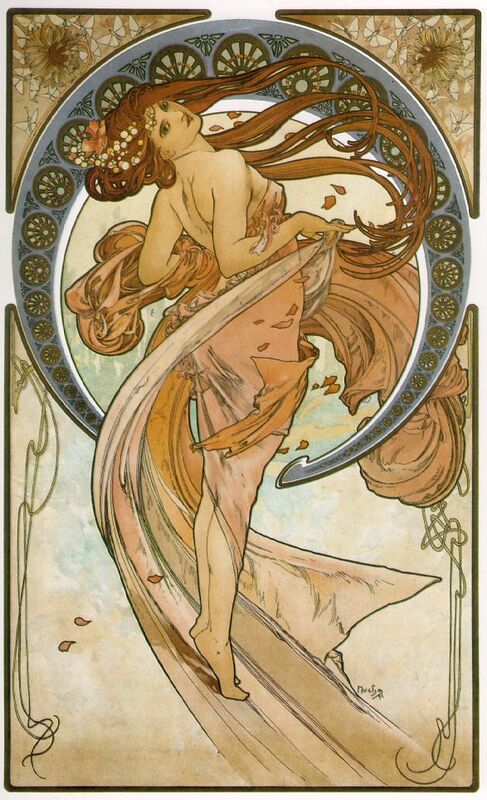 A featured painter is Alphonse Mucha. His images just transport me, like great art is supposed to do. 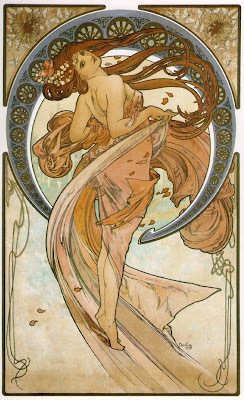 From the introduction of "All Color Book of Art Nouveau" by Geoffrey Warren: "Think of a sensuous line; of a flowing line; a line which bends and turns back on itself. Think of the feminine form, rounded and curving. Think of plant forms growing and burgeoning. Think of flowers in a bud, in overblown blossom, as seed pods. Think of lines which seem not to conform; think of waves, think of women's hair; think of twisting smoke. Think too, of controlled lines: lines which begin parallel but then converge and eventually contradict each other. Think of the resulting stress. As the English artist, Walter Crane, one of the earliest exponents of the 'New Art' said in 1889: 'Line is all-important. Let the designer, therefore, in the adaptation of his art, lean upon the staff of line--line determinative, line emphatic, line delicate, line expressive, line controlling and uniting."